First off, if you are looking for more reading on Millennials there is a lot out there. If you are looking for some of the ones I find most interesting, click on “Articles on Generations” in the tabs above. Sometimes I forget that most Christians, most people even, think that questioning something is disrespectful or aggressive on the one hand, or a sign of weakness on the other. We have all been in group situations either at school, work or in the community where a leader, teacher or presenter asks if there are questions in regards to the topic being presented. Often no one does. And it is not because the material has been presented so well that there are no questions, but no one wants to sound like they don’t understand something or don’t know what is going on. Well, in the Church and among Christians we take this idea to a new level. In my experience, most Church members really don’t want to appear like they have faith related questions. Worse yet, when they do know something about the bible or faith doesn’t seem to make sense, many believe that questioning it might cause them to lose their faith. Often when I do pre-baptismal visits with families who are bringing their child to be baptized (too many times because grandparents want them to, not because they are active church folk) they end up asking questions about the Bible and God and the Church. Usually I am told that grandma and grandpa, other older relatives, previous pastors or other church folk have to told them not to ask questions – just “accept it on faith”. A new generation asks why? In an article I recently read on Hiring Millennials for tech startups, it suggests that Millennials are more likely to ask “why?” than previous generations, and therefore more valuable in helping companies finding focus and direction. I have no idea if this is true or even measurable, but some of my experience supports this claim. As a strong ENTJ on the MBTI, my deep need and compulsion to ask “why?” may very well be a personality trait more than a generational trait. However, my need to ask “why?” is precisely why I am still a Christian. The fact that I asked “why?” and questioned my faith is at the foundation of why I became a pastor. Even from a young age I had the feeling (or idea) that the Bible didn’t always make sense. As a teenager, I knew that things like creation, the flood, jonah and the whale, and many other biblical stories as presented by some fundamentalist church members didn’t jive with science class at school. Fortunately, Lutheran doctrine and a pastor who didn’t want to take a stand on anything, allowed the rest of us in my home congregation to feel like it was okay to be members and not buy into the literalism stuff. But still, I could feel the questions beginning to stack up when it came to the bible and faith by the time I was finishing high school. I had great youth leaders who were introducing us to all sorts of ideas like helping the poor, the effects of poverty and our systems of wealth that enable it. They were one of the important pieces that kept me in church. I also stayed connected by being involved with music in worship, going to the Lutheran Student Movement in university, and working at Bible Camps in my summers. My family was great, they left my questions room to be asked, even when my parents didn’t have the answers. University was sometimes a struggle to keep up my faith. It seemed very ‘in vogue’ in 2001 for historians, political scientists and other liberal arts profs to dump on Christianity and the Bible. And if I hadn’t been fortunate to grow up in a church and family that was steeped in scripture, I might have believed their criticisms. But as much as my questions were stacking up in regard to the contradictions in the bible and contradictions in the church, the criticisms weren’t making sense either. I was taking history and religious studies, and I could tell that I wasn’t getting the whole picture. I would feel sick as profs described Christianity, not because my beliefs were being questioned, but because a fundamentalist Christianity, that wasn’t the faith I knew, was being questioned. I soon became tired of religious studies and searched the course catalogue for something that I wanted to take, something about faith. And then I stumbled onto the small Roman Catholic faculty of theology at the University of Alberta. Half way through my Bachelor’s degree, I started taking as many classes as I could. Classes from professional theologians (not historians and religious studies profs). Classes on science and religion not science classes that referenced the bible. Classes on Christian doctrine and theology not a social science of Christianity. Classes on real biblical scholarship not English literature that included the bible. Classes on real church history, not history in which the Church was marginally present. The profs and classes made me feel like I finally had a reference point for my questions. It was like they gave me the box with picture on it of the puzzle I had been working on. I finally knew what I image I was putting together. Theology became a serious discipline. Biblical studies finally showed me a hermeneutic that made sense. Church history filled in gaps of the secular history I had been studying. But most importantly, no question was disallowed. Everything was on the table. And the questions we couldn’t answer, like “does God exist?”, were given a framework to know why we couldn’t answer them. My last two years on my undergraduate degree were like the last half of a Survivor puzzle, everything was coming together faster and faster. Add a Master of Divinity and 4+ years in the parish, and I know that I don’t have all answers, I never wanted them. What I do have is the tools to ask the best questions and then make my way through them… which usually leads to more questions. What makes me so sad is meeting people my age who are only loosely connected to their faith because their questions were shut down. They were told to fall inline and stop causing trouble by questioning the bible, the church, faith. I don’t know if that tactic really ever works, but I think Millennials have wanted to ask “why?” more than our parents. I think it is growing up in a world where we have been bombarded with media, marketing and sound bytes. I want something deeper, something with meat. Something that has room for questions. The Church has led the way in the “Don’t question us” department for decades. Maybe one of the things politicians and corporations have learned from us is that it is a lot easier to suppress questions than it is to answer them. Maybe it is time for the Church to lead the way in “Ask us anything” department for a while. Maybe some of my Millennial peers might find getting the chance to ask “why?” is a compelling reason to try church. Just remember, “just accept it on faith” is always a bad answer. “I don’t know, so let’s find out together” is always a good one. 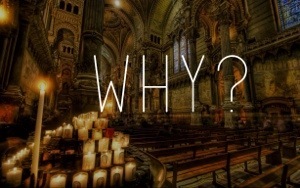 If we are serious as about sharing our faith, it is time for the church to allow room for a lot of “why?” questions. Everything has to be on the table… and it is not just Millennials who need to have some “why?” conversations – we all do. Previous PostA Sermon for the riff raff and huddled masses of the SaintsNext PostWant to kill your church? Start a program!